This is a sweet and spicy salad that is good as a side dish accompaniment with grilled fish or fish tacos. It also goes well as a side for the Flank Steak with Pepper Lime Cilantro Marinade dish. It’s light and refreshing with a bite. 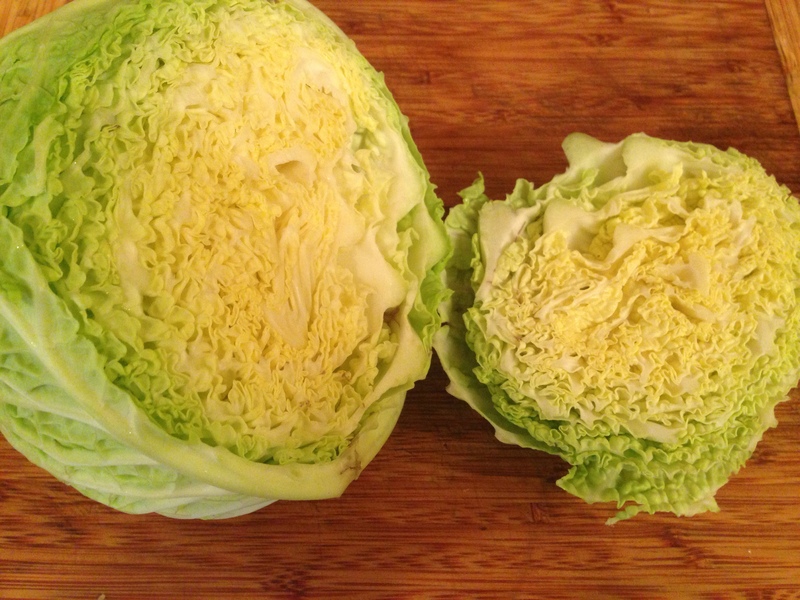 The base is Savoy cabbage – a crinkly, crisp, light leaf cabbage. 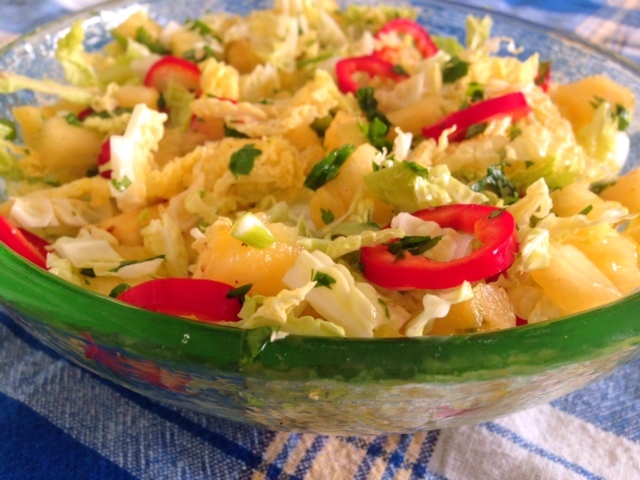 Pineapple makes this salad a bit like a salsa and the red jalapeño peppers add color and punch. The recipe calls for 1-2 jalapeños depending on how spicy you want it to be. Avocado adds a bit of cooling to the jalapeños, though you can make this salad with or without the avocado. If you do add avocado, add it at the end right before serving. The dressing has no fat; it’s simply 3 tablespoons of apple cider vinegar balances well with the pineapple juice, cilantro and jalapeños. Add all ingredients, except the avocado, to a bowl and let it sit for 20-30 minutes before serving so the flavors all mesh. Then add avocado at the end and mix through. Add all ingredients, except the avocado, to a bowl and mix through. Let it sit for 20-30 minutes before serving to give time for the flavors to mesh. Add avocado, if using, right be fore serving and mix through. This entry was posted in Blog, Recipes and tagged Fat Free, gluten free, Jalapenos, Pineapple, Savoy Cabbage on April 27, 2014 by Leslie.